The Bombay is a parlor panther, the "patent-leather kid with the copper penny eyes." The Bombay has the distinction of being the blackest cat in the cat fancy. Once the cat is mature, the coat is black to the root, short, tight and extremely shiny. Even the paw pads are black. It's hard to say what is more eye-catching about the Bombay, the golden eyes or the shiny black coat. The combination is absolutely striking. The Bombay is a small, muscular cat and deceptively heavy. When you pick one up, you will be surprised at how much he weighs. You may enjoy seeing a Bombay walk with a sway reminiscent of the black leopard. This lovely breed of cat is the result of the dream of a long-time cat breeder and exhibitor, Nikki Horner of Louisville, Kentucky. The Bombay is a man-made breed, a cross between a black American Shorthair and a sable Burmese. The Bombay was accepted by Cat Fanciers Association (CFA) in 1976 and the breed is also recognized by the American Cat Fanciers Association (ACFA) and The International Cat Association (TICA). Outcrossing to both sable Burmese and black American Shorthairs is still allowed by CFA, although the Bombay is a true breed with its own particular look and characteristics. While sable kittens may be produced in litters, especially if one of the parents is a sable Burmese, this quintessential black cat is only allowed to be shown by CFA in black. In appearance, the Bombay looks very much like a Burmese, however, the Bombay will often be a bit larger and not quite as compact as the Burmese. The head of a show-quality Bombay will be round with a short muzzle. Because the Bombay is a blending of two very different breeds, it is often difficult to produce show-quality cats. Most litters will contain more pet-quality kittens than show-quality. Even though they may not have such a rounded head and short muzzle, the pet-quality kittens will have all of the other characteristics of the breed and will make wonderful companions. They are slow ​to mature in appearance and may not display all of their characteristics until 18 months of age. The Bombay is a wonderful union of both parent breeds. He loves attention and to be carried around, often on his caregiver's shoulder. In fact, Bombays are truly "lap fungus" You cannot get them off you once they are there. A Bombay cat is likely to bond most with one family member. Your Bombay will follow you from room to room and will almost always have something to say about what you are doing. If you are looking for an affectionate cat, the Bombay is a good choice. But if you are rarely at home, a Bombay may suffer from the lack of attention. Bombays are also wonderful with guests, children, and dogs. You won't find a Bombay hiding under the bed when company arrives. Your Bombay will be part of the greeting committee. While focusing on a special person, this cat will not be aloof with anybody. Bombays are a good choice for a bustling household as they adapt well to living with people and other pets. When your cat isn't interacting with humans, look for it to be resting near a heating vent as they love heat sources. The short coat of a Bombay is easy to care for with a little brushing about once a week. You will rarely need to bathe a Bombay. A relatively active breed, the Bombay is always happy to play. The American shorthair influence tones down the activity level to a bit less than the Burmese. The Bombay is also a little less vocal than the Burmese, but not always. They are very opinionated and truly have their own idea of how the household should be run. The Bombay is not only intelligent, it is trainable. You can play fetch with a Bombay and even train one to walk on a leash. It is recommended that you spay or neuter a Bombay at 5 to 9 months of age. This breed reaches sexual maturity early, as young as 5 months. 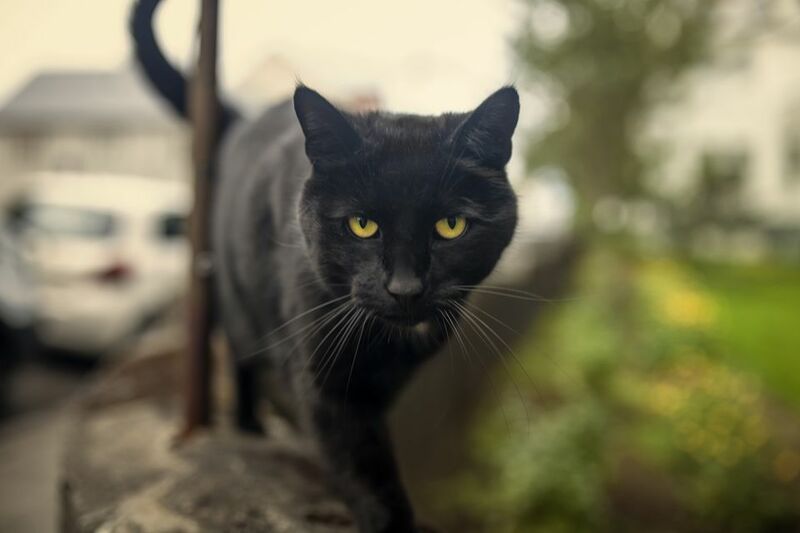 Bombay cats may have sinus problems and runny noses. As a relative of the Burmese, Bombay kittens may inherit craniofacial defect and be born with severely deformed heads. Such unfortunate kittens are euthanized and breeders take note to ensure cats with that gene are not bred. Obesity can shorten any cat's lifespan, so you should monitor your cat's weight and take action when he has put on excess pounds. Take care of their dental hygiene, with toothbrushing to prevent gingivitis. Be sure to take your cat for regular veterinary check-ups and get the recommended vaccinations and preventative treatments. Keeping a Bombay as an indoor-only cat will help prevent many diseases, fight injuries, and accidents that can shorten a cat's lifespan. The Bombay breed doesn't have any special dietary requirements. As with all cats, it is recommended that you provide a high-quality wet food and some quality dry food as well. If your cat is showing signs of obesity, discuss the feeding schedule with your veterinarian. Special diets may be needed for kittens, elderly cats, and cats with health conditions. Be sure to provide fresh, clean water for your cat. Before you decide whether a Bombay cat is the right one for you, research the availability as they are still relatively rare. Talk to reputable Bombay cat breeders and owners. You may want to contact or join the Bombay and Asian Cats Breed Club. Otherwise, check out our other cat breed profiles.